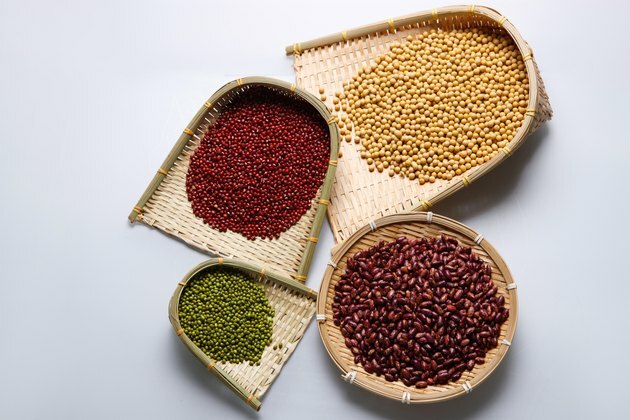 It's no wonder the American Diabetes Association lists beans, such as chickpeas, as a superfood -- they provide significant amounts of protein, fiber, vitamins and minerals. Canned chickpeas are a quick and easy alternative to using dried chickpeas, but they aren't as nutritious and may come with some unwanted chemical exposure. If you're choosing your food solely based on calories or carbohydrates, canned chickpeas are better than dried. Otherwise, you may want to reconsider. A 100-gram serving of boiled dried chickpeas, or slightly less than 2/3 cup, has 164 calories, 2.6 grams of fat, 8.9 grams of protein and 27.4 grams of carbohydrates, including 7.6 grams of fiber, or 30 percent of the DV. The same amount of canned chickpeas does have fewer calories, with 139, and fewer carbohydrates, with 22.5 grams, but these chickpeas have more fat, with 2.8 grams, and less protein and fiber, with 7.1 and 6.4 grams, respectively. Canned chickpeas contain the same essential vitamins and minerals as chickpeas cooked from dried, but in smaller amounts. For example, a serving of cooked dried chickpeas has 43 percent of the DV for folate, but a serving of canned chickpeas only provides 12 percent of the DV. In addition, for iron, manganese, phosphorus, zinc, copper and magnesium, the percent of DV in canned chickpeas is five to 10 points less than for chickpeas cooked from dried. Folate is essential for cell division, and you need iron and copper for forming red blood cells. Magnesium and phosphorus are essential for forming DNA, and manganese and zinc help with wound healing. One of the main drawbacks of canned chickpeas is their high sodium content. Consuming excessive amounts of sodium increases your risk for high blood pressure and heart disease, and processed and canned foods are among the main sources of sodium in the typical American diet. While chickpeas cooked from dried have only 7 milligrams of sodium per 100-gram serving, the same amount of canned chickpeas has 246 milligrams, or 10 percent of the DV. Unless you purchase canned chickpeas in cans labeled "BPA-free," you'll be exposed to bisphenol A, or BPA, each time you eat these beans. Regular cans are lined with a substance containing this chemical, which interferes with estrogen and may also affect the prostate, the brain and the behavior of individuals exposed to it, especially infants and children.